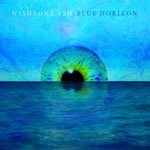 Share the post "Album review: WISHBONE ASH – Blue Horizon"
If you can set aside the bitter dispute over the trading name, there is no doubt that Andy Powell has worked tirelessly to produce albums that are completely befitting the Wishbone Ash heritage. He’s also regularly treading the boards to ensure that legacy is perpetuated. ‘Blue Horizon’ is more diverse in terms of the songwriting input, with Muddy Manninen prominent, Andy Powell’s son Aynsley contributing two songs, and there’s also one from former guitarist Roger Filgate, the excellent ‘Strange (How Things Come Around). The album also sees the return of Pat McManus on two tracks including the co-write ‘All There Is To Say’. The album starts in Classic Ash fashion, ‘Take It Back’ featuring those trademark attractive vocal harmonies before the inevitable guitar breakdown although ‘Deep Blues’ and ‘Mary Jane’ are fairly perfunctory rockers. The somewhat soft rocker ‘Way Down South’ is reprieved by the superior guitar coda and the band are not averse to some contemporary critique on ‘Tally Ho!’ which features some of the best guitar interplay on the album a la The Outlaws ‘Green Grass And High Tides’ but before that song’s meltdown section. Aynsley’s Powell’s ‘American Century’ introduces the band’s prog tendencies that have been present since the early albums and is a nice nod in that direction. If there’s a criticism, there’s an absence of the gritty straight ahead guitar duelling of old – and whilst we have no right to expect another ‘The King Will Come’ something in that vein would have been very welcome. As it is, we have to be content with the admittedly very fine play-out on the title track. This entry was posted in ALBUM REVIEWS, ALBUM REVIEWS (Mobile), All Posts and tagged album, Andy Powell, Blue Horizon, Bob Skeat, Joe Crabtree, Muddy Manninen, Pat McManus, review, rock, Wishbone Ash. Bookmark the permalink.